Delta Force Paintball Brighton: 4 State-of-the-art paintball centres! Looking for ‘Paintballing Brighton‘ to find the ultimate paintball venue on the South Coast? Then listen up! Delta Force Paintball has four outstanding paintball centres, all within close reach of Brighton; covering West Sussex, Surrey and Kent. The most convenient centre to Brighton is our South London Paintball centre in Crawley, West Sussex. The venue can be reached in just one minute from the M23 motorway, and is surrounded by the attractive looking Sussex countryside. It features six exciting game zones, including ‘Castle Wallenberg,’ ‘The Haunted Graveyard’, ‘Afghan Fort’, ‘Viet Cong Village’ and ‘Chemical Alley’. For those who are willing to travel a bit further, our two paintball centres in Effingham, Surrey may appeal. Found just off the M25 at junction 10 and only metres apart, our South West London Paintball and Surrey Paintball centres offer a fantastic selection of state-of-the-art game zones, with Hollywood style scenarios, including: ‘A Bridge Too Far’ where participants have to try and seize control of the heavily protected bridges, ‘London Bus’ which has original bright-red double decker buses for players to hide in and ‘Mad Murphy’s Jungle Attack’ where your task is to save an injured airman hanging from a tangled parachute, somewhere deep inside the rainforest. Players can also use a number of the paintball pyrotechnics we have available(paint grenades, smoke grenades and MK5 Thunderflashes). A third option for individuals looking for ‘Paintballing Brighton’ is our Kent Paintball centre. 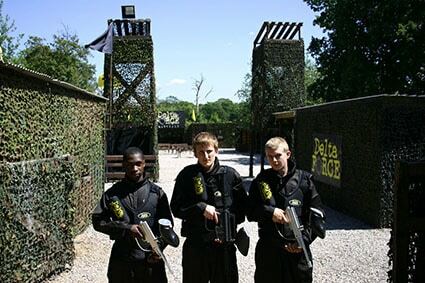 Situated in the beautiful countryside and only minutes from Clacket Lane services (junction 5) on the M25 services, Kent Paintball Centre is one of the most recent additions to the Delta Force family. 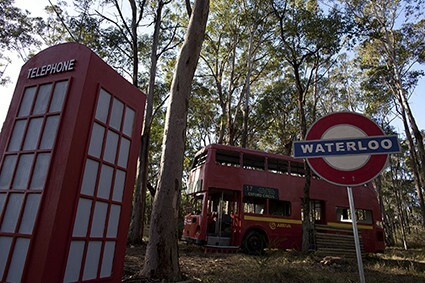 It has an outstanding reputation for leading the way in paintball technology, with 7 blockbuster-type game scenarios to experience, including: ‘Wild West Saloon’ which features a mini village with Wild West themed buildings and abandoned vehicles. There’s also ‘London Underground’ (an updated version of the popular ‘London Bus’ game), featuring black taxicabs and double decker buses! If you’d like more information about paintballing Brighton with Delta Force or to book your paintball event with us, call 0203 869 9301 and speak to a member of staff who will be ready to take your call.